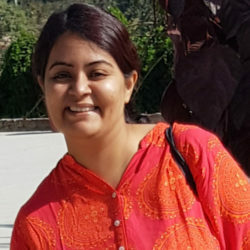 Pregnancy is an enjoyable, exciting and wonderful time in a woman’s life, as it highlights the woman’s extraordinary powers given by Nature to her for providing a bridge to the new future. When a woman is pregnant it is important that she is taking care of her body to the best of her ability to create the best possible environment for her baby. 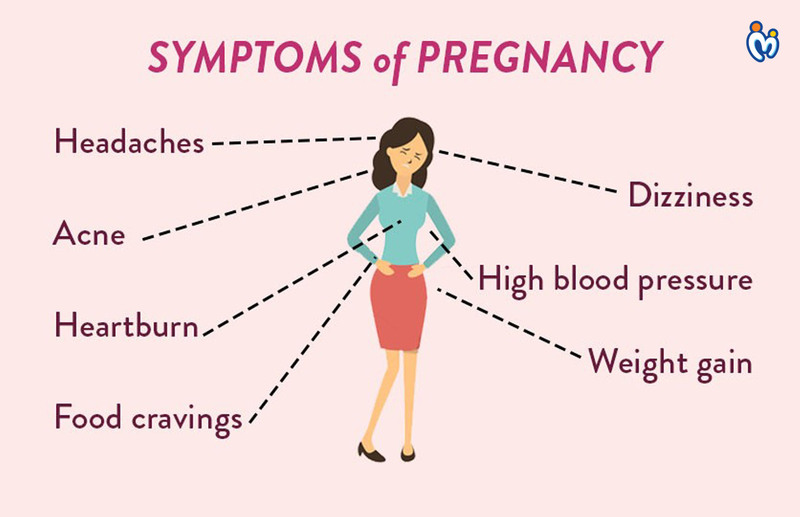 Other than pregnancy tests and ultrasounds, there are other signs and symptoms you can look out for to know if you’re pregnant. 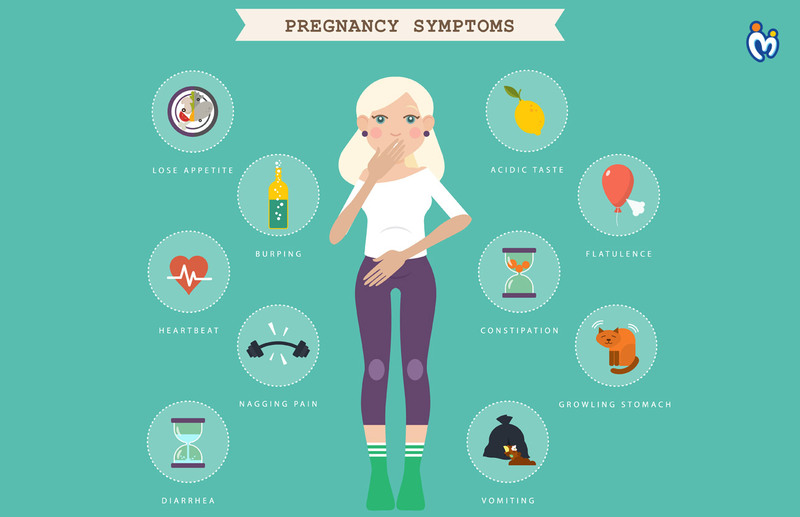 The earliest sign of pregnancy is not only a missed period but there are other things you have to look for. It always said that your first week of pregnancy is decided by the date of your last menstrual period (LMP). The last menstrual cycle of the respective month is considered the first week of pregnancy, even if you weren’t actually pregnant yet. From week 1 to week 4, everything happens on a cellular level. During implantation of the egg, some bleeding can take place in some females which can be mistaken for a light period, the color shows as pink, red or brown. The spotting is seen only on wiping the area as this is very less. 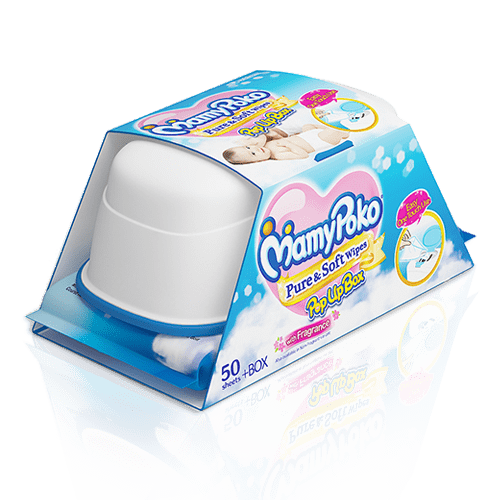 This can last for two to three days and does not require any treatment. Abdominal cramps can be felt along with spotting, giving a feel of periods. But it can be a misnomer and should not be ignored. Sometimes it can also be accompanied by mild to severe back or abdominal pain. Once implantation is complete, your body will begin to produce human chorionic gonadotropin (hCG). This hormone helps the body to maintain the pregnancy and increases in large number till the delivery. 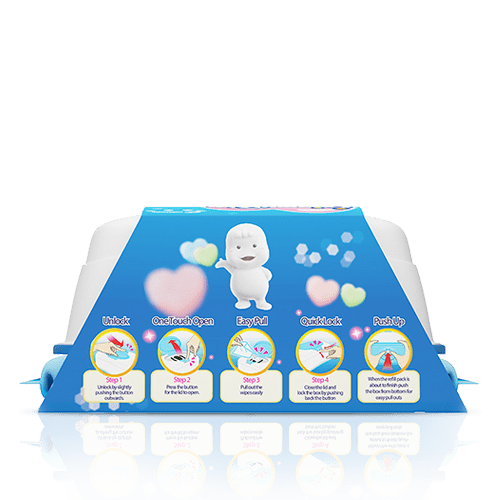 It also tells the ovaries to stop releasing mature eggs each month which is called as no periods now for next nine months. 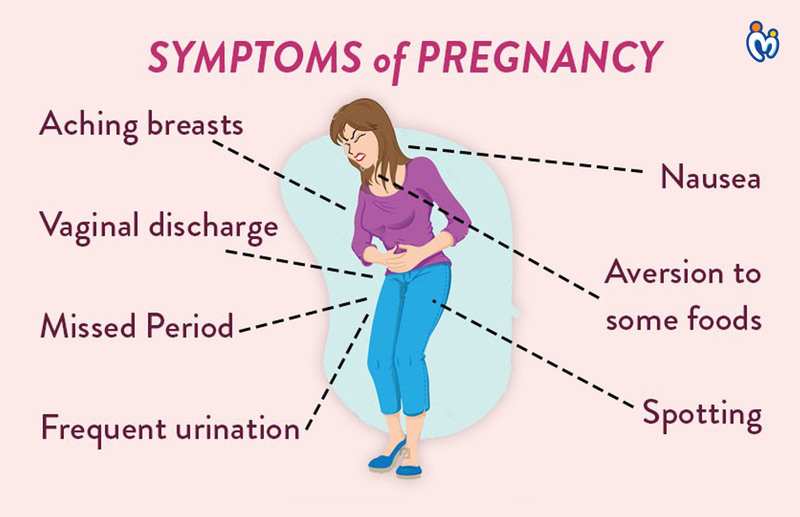 You will miss your next period four weeks after conception giving you a positive sign. Most tests done with strips at home can detect hCG even eight days after a missed period and give a sign of positive or negative conception. A pregnancy test will be able to detect hCG levels in your urine and blood and show if you are pregnant. During pregnancy, your body increases the amount of blood. This causes the kidney to produce more fluids than usual, which leads to a heavy bladder giving a feel of fullness. Increased levels of hormones also play a major role in bladder health. You may keep on running to the washroom very frequently or also undergo accidental leaking after every half an hour. Bloating may occur during early pregnancy. This may be due to hormonal changes, which can also slow your digestive system. You may feel constipated leading to a bloated abdomen. The tummy becomes hard and round when seen visually. Because of release of much more progesterone, body makes more gas during pregnancy. Progesterone is a hormone that relaxes muscles throughout your body in pregnancy, including your digestive system. These relaxed muscles slows down the rate of digestion, leading to gas, bloating, burping and uncomfortable sensations in the gut. 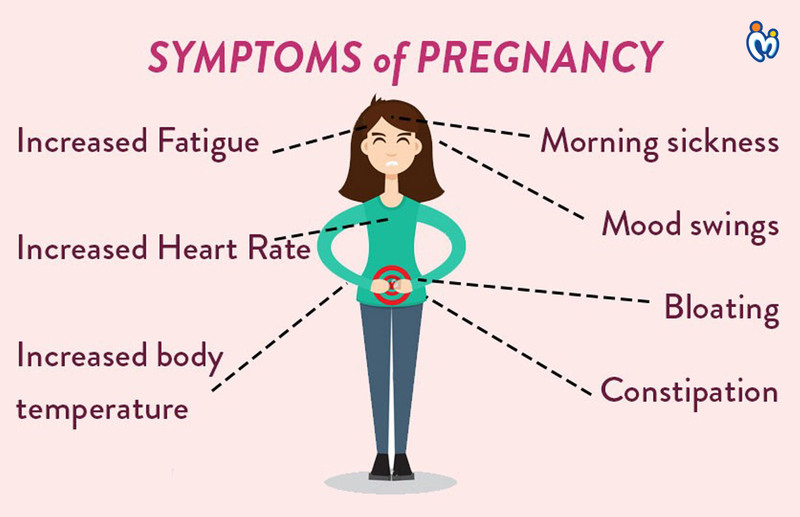 Fatigue is then earliest sign of pregnancy that mostly all women experience in the first trimester of pregnancy. It eventually gets better with the start of the second trimester and returns back in the third trimester, though it varies from pregnancy to pregnancy. During the first trimester, a huge amount of energy is required for building a life-support system for your baby’s growth and development, namely the placenta, which is why you might be feeling extra fatigued. Your blood sugar levels and blood pressure are also at lower levels as now you are sharing everything with your baby. Hormones, especially increased progesterone levels, are responsible for making you sleepy and lazy. In addition to the physical changes occurring in your body, also emotional changes contribute in decreasing energy. The sudden rise of hormones in your body can cause headaches in early pregnancy. A roller coaster of changes takes place in a female body after conception. Women’s breasts may become sore, tender and swollen because of hormonal imbalances causing irritation and sometimes pain. To conclude, every female has a different body, different stamina and feelings. Some may undergo major changes and some may take it as a walk in the park! It’s best to note your symptoms and consult a specialist!